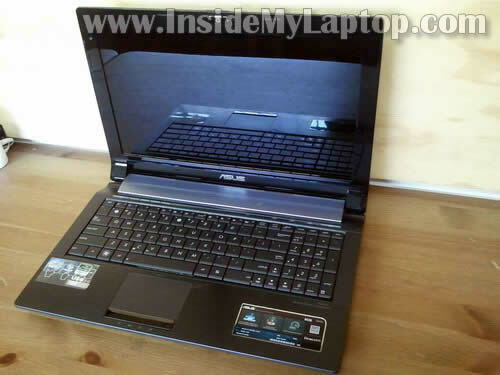 In this guide I’ll disassemble an Asus N53S laptop. 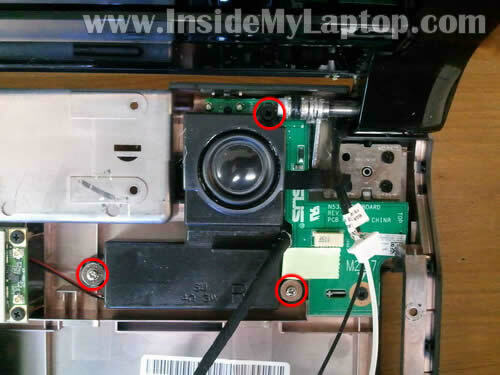 My target – fixing failed DC power jack. Problem description: the battery started charging intermittently. Moving the power plug inside the DC jack fixes the problem for a while but eventually it fails again. The battery didn’t charge with another AC adapter either. 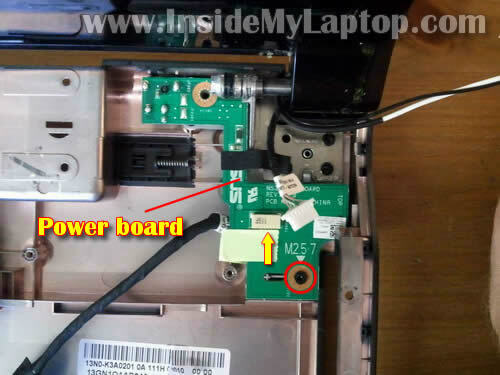 In Asus N53S the DC jack is soldered to the power board. 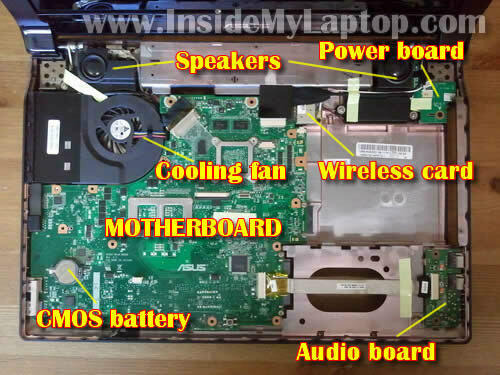 This guide explains how to access and remove the power board. 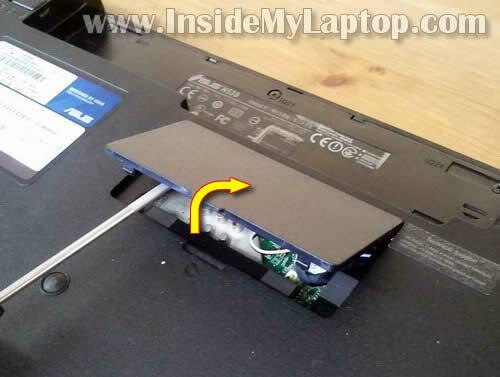 Using a small screwdriver lift up and remove the bottom cover. There are four rubber feet located on the bottom. Remove all four feet with a sharp object. Remove four screws found under rubber feet. 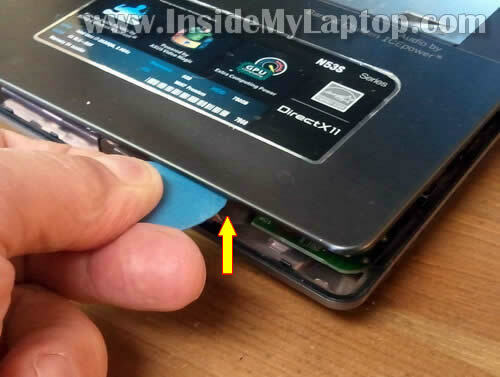 Slide the hard drive/memory cover and remove it from the bottom. Remove three screws securing the hard drive assembly. 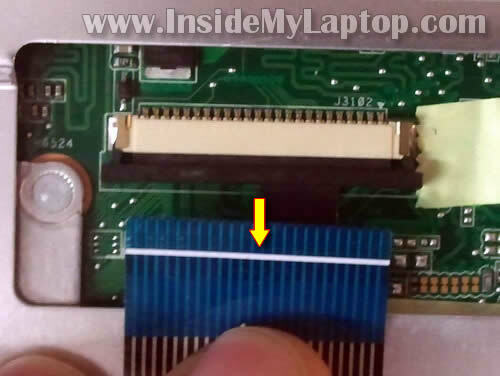 Slide the hard drive assembly to the left to disconnect the hard drive from the motherboard. 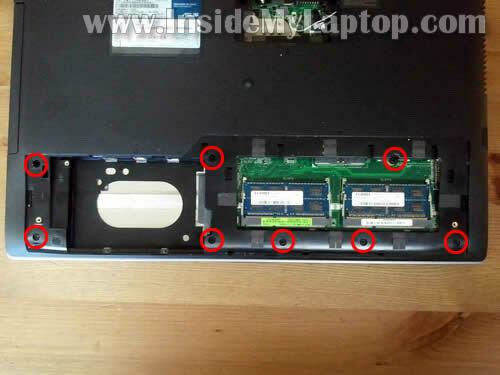 It’s not necessary to remove the hard drive assembly for the purpose of my guide. 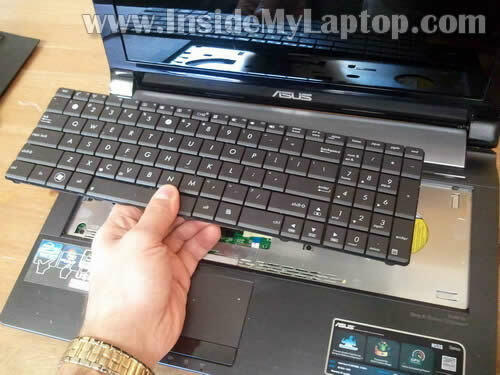 You can leave it connected to the laptop. All four memory slots located under the same bottom cover. It’s not necessary to remove memory modules for the purpose of my guide. 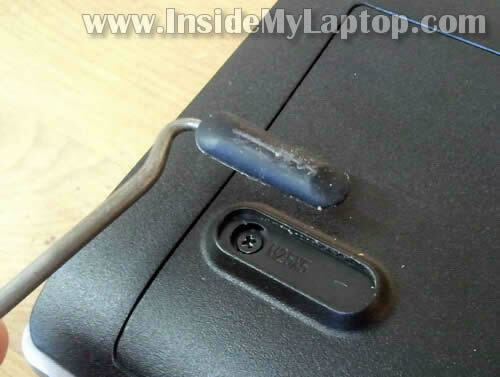 Push on the latch with a small screwdriver and at the same time lift up the keyboard a little bit. 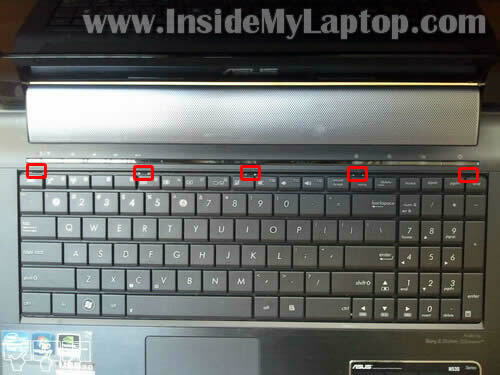 When the keyboard is lifted, it will not allow the latch to lock again. 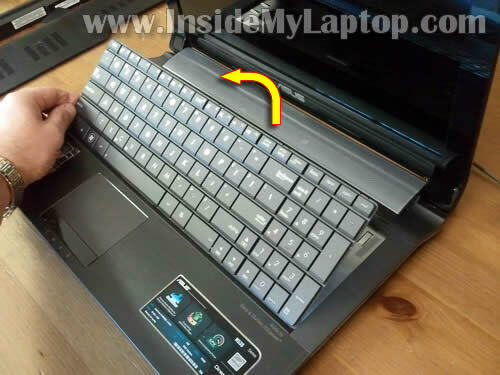 After all latches released you should be able to lift up the keyboard and place it upside down on the palmrest. 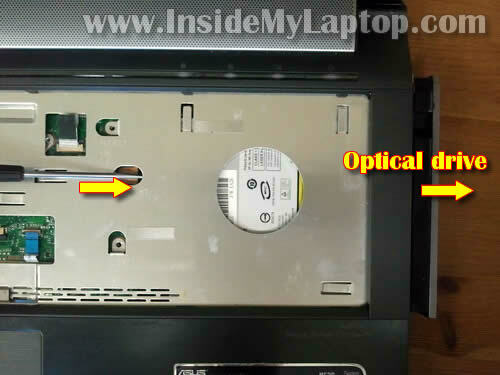 The keyboard cable connector located under the keyboard. You’ll have to unlock the connector and release the cable before you remove the keyboard. 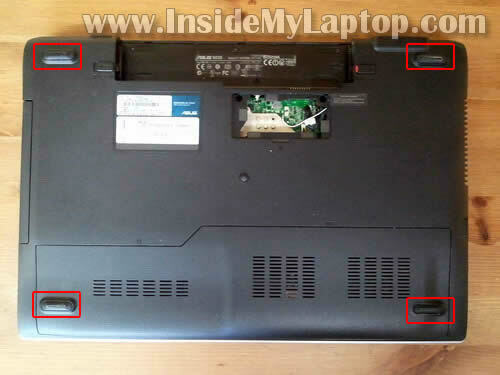 In order to unlock the connector move the brown locking tab about 2 millimeters to the direction shown by two yellow arrows. Если на клавиатуре ноутбука не работают клавиши, то с вероятносью 99% клавиатуру надо будет менять на новую, чистка клавиатуры как правило не помогает. Приобрести клавиатуру к ноутбуку и установить можно самостоятельно. 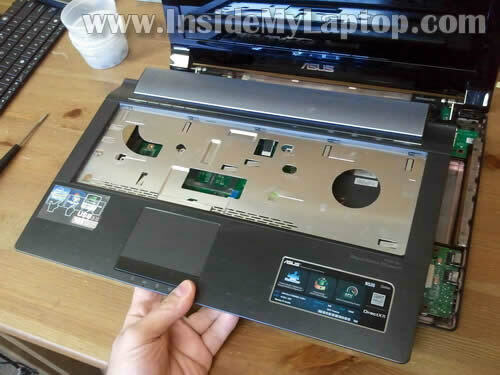 Например, клавиатура к Asus N53S с доставкой обойдётся совсем недорого. Обязательно заказывайте клавиатуру для своего языка. 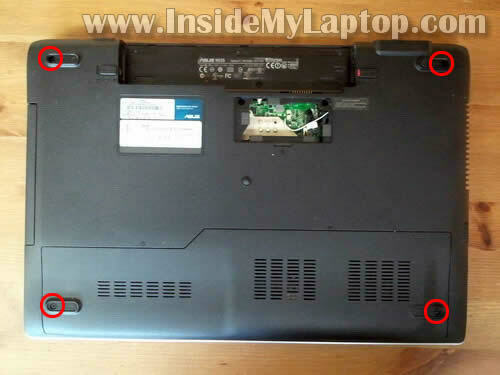 Disconnect the touchpad cable (left) and power button board cable (right). 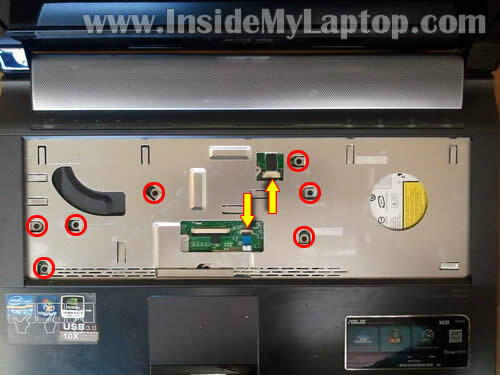 Unlock the power button board connector same way you unlocked the keyboard connector. Remove cable from the connector. 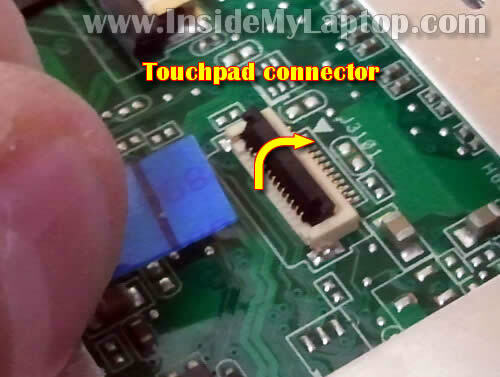 Here’s how to unlock the touchpad connector. 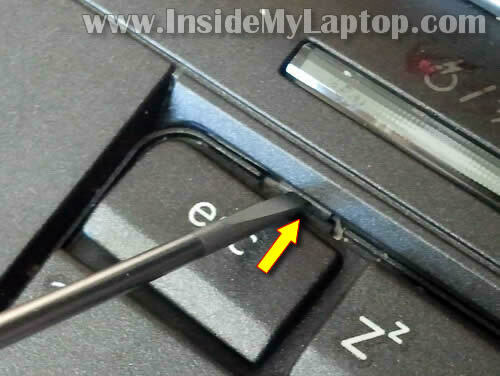 Lift up the left side of the brown locking tab with your fingernail. The tap will open up at a 90 degree angle. After that pull the touchpad cable from the connector. 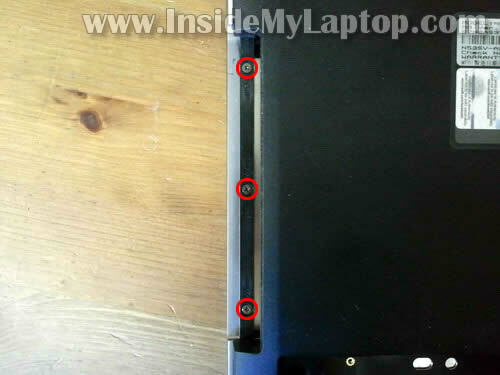 One of the top cover screws also secures the optical drive (DVD drive). Now you can remove the drive. 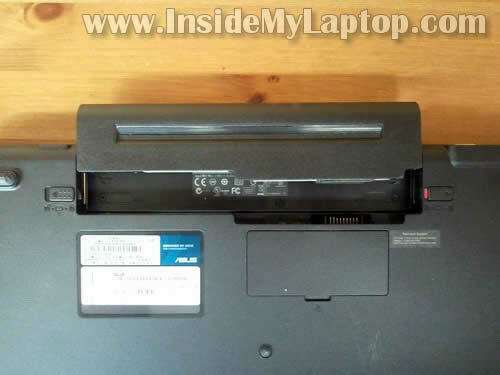 Don’t forget to remove three screws from the optical drive bay. 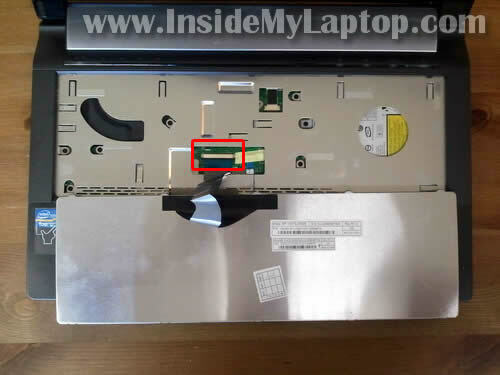 After you removed all screws from the bottom of the laptop and top cover, you can start separating the top cover from the bottom. You can use a piece of soft plastic to separate these parts. 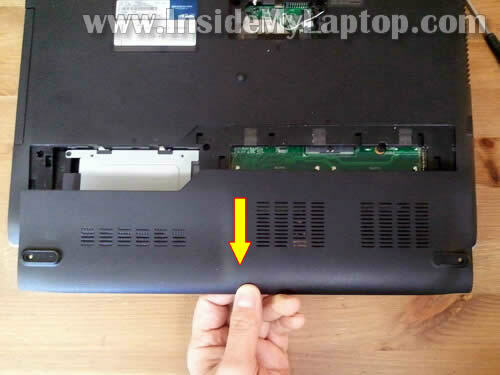 Continue removing the top cover assembly with your fingers. The top cover assembly removed. 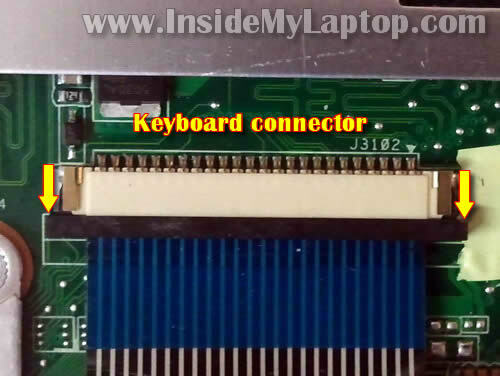 Disconnect the power board cable from the motherboard. 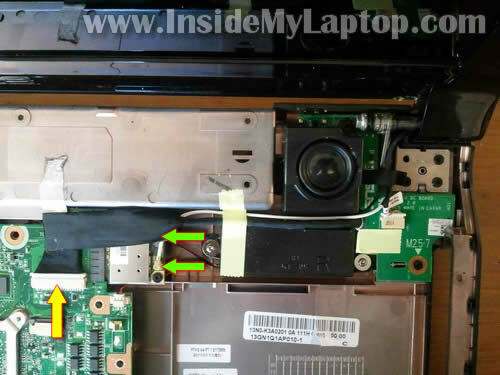 Remove three screws securing the right speaker. Remove one screw securing the power board. Diconnect cable from the power board. 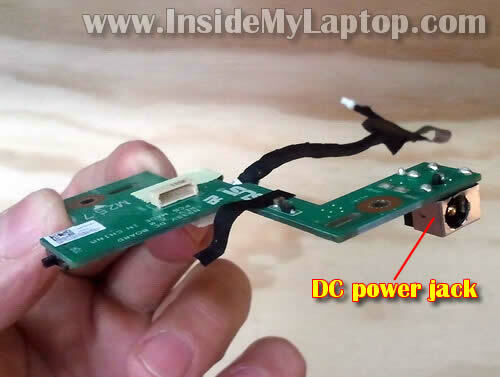 Now you can remove the power button board from the laptop base and repair or replace the failed DC power jack. The DC power jack soldered to the board.